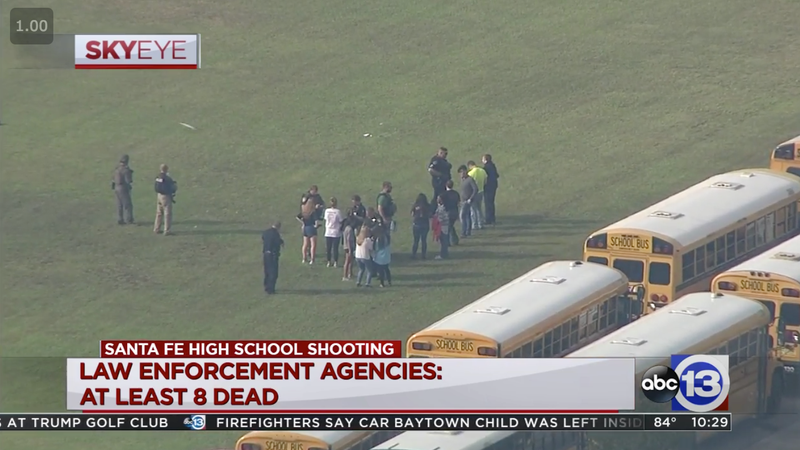 At least eight people have died and “several” more have been injured in a mass shooting early Friday morning at high school in Santa Fe, Texas. KTRK News reports the suspect, a student, is currently in police custody. Another person has been detained. The gunman, seen by at least one witness holding something resembling a shotgun, opened fire at approximately 7:45 a.m. local time. President Trump, who has already tweeted about the incident, is expected to make a statement shortly. We will update the post as more news arrives. Update [2:30 p.m. EDT]: According to the AP, 17-year-old Dimitrios Pagourtzis has been identified as the suspected shooter. The Santa Fe Independent School District (SFISD) tweeted earlier today that explosive devices have been found on or near the school campus, and instructed those in the area to “not touch any items out of place and call 911” if they encountered anything suspicious. SFISD also tweeted that the high school is still at active crime scene. According to the Washington Post, this is the 16th school shooting during school hours in 2018. Update [6:01 p.m. EDT]: CNN reports that, according to Texas governor Greg Abbott, 10 people were killed and 10 others were wounded. Nine students and one teacher are among the fatalities.